Recharged after a rest and some food, I arrive back at Linden Winery Estate round 3pm, just as teams begin arriving. 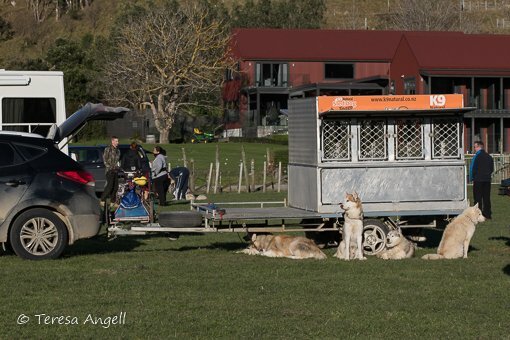 Trailers parked, the dogs get walked, harnesses put on, then tethered by the trailers. Every team I watch shows a very close bond between dogs and musher. An example of this is in the photo of Hayden, Kaino and Bailey. Also spotted is the youngest member taking a well needed nap to re-charge for the late afternoon racing, under the watchful eye of Lisa. My focus this afternoon is to capture the many parts of rig racing in action. From the two dog teams right up to the largest team, this weekend, running eight dogs. There is beautiful warm ‘golden hour’ light for the start. Dust flying off the dogs’ paws as the teams power off the start line. Having walked the long, grinding hill every day myself, I take my hat off to every single team that ran this course and conquered this hill. Teams heading home, flying down the vineyard straight towards the bridge. Then the tricky sharp left, then right over the bridge. This was handled best by the mushers who gave firm, direct commands to their team. Impressive seeing the immediate response and correction from the dogs. Once the last rig was through I hiked back to the base paddock packing up for the day. Time to relax, sleep and ready myself for an early, cold start for the final race session on Sunday Morning.